This article is about the actor. For the basketball player, see Kevin Durant. Kevin Serge Durand (born January 14, 1974) is a Canadian actor and singer. Durand is known for portraying Vasiliy Fet in The Strain, Joshua in Dark Angel, Martin Keamy in Lost, Fred J. Dukes / The Blob in X-Men Origins: Wolverine, Gabriel in Legion, Little John in Robin Hood, Jeeves Tremor in Smokin' Aces, and Carlos in The Butterfly Effect. He received a 2012 Best Supporting Actor Genie nomination for his portrayal of Lenny Jackson in Citizen Gangster. A former comedian, Durand has performed in a wide variety of starring roles in numerous independent and major studio features, ranging from comedies to drama to science fiction and action thrillers. Durand was born in Thunder Bay, Ontario, the son of Reina (née Perreault) and Serge Durand. He is of French-Canadian descent. Durand was an ice hockey player in his youth and initially displayed an interest towards becoming a rapper. He also discovered a penchant for stand-up comedy for which he was named one of "Canada's Funniest New Comedians" in 1994. According to an interview with radio and television personality George Stroumboulopoulos, a play that had been touring in his hometown coerced Durand to audition and allegedly made him realise "where he belonged." At the age of 20, Durand moved to Hollywood. Durand is a character actor whose first big movie break came when he was cast in Mystery, Alaska. With a muscular physique, distinctive facial features, and suave voice, Durand is frequently tapped for roles as a thuggish brute, a law enforcement officer or as a gangster. His film credits on both the good and bad sides of law enforcement include the portrayals of Booth in Walking Tall, sidekick Red in Wild Hogs, the psychotic neo-nazi Jeeves Tremor in Smokin' Aces, the title role in Otis E., Gabriel in Legion, Little John in Robin Hood, and the hired thug Tucker in the 2007 remake of 3:10 to Yuma with Russell Crowe and Christian Bale. Recent film successes include, X-Men Origins: Wolverine playing the comic book character Blob and the role of Ricky in Real Steel, both with Hugh Jackman. In 2012, he co-starred in Citizen Gangster and David Cronenberg's Cosmopolis, the latter film opposite Robert Pattinson, Paul Giamatti, and Samantha Morton. He will appear in The Truth with Andy García and Forest Whitaker, and took on video game character Barry Burton in the 5th installment of the Resident Evil movie franchise, Resident Evil: Retribution. Durand's combined box office numbers total over 2.5 billion dollars worldwide. In 2013, he appeared in the film The Mortal Instruments. He co-starred in Darren Aronofsky's Noah and Atom Egoyan's two newest films, Devil's Knot and The Captive. Since 2014, he has starred as Vasiliy Fet in Guillermo del Toro's FX TV series The Strain. In 2015, he stars as Harbard the Wanderer in History Channel's original series Vikings. Durand also has acted in a number of Off-broadway stage productions, including originating the role of Injun Joe in The Adventures of Tom Sawyer. Durand has played series regulars on shows such as James Cameron's Dark Angel as Joshua, Agent Jay Swopes in the American remake of Touching Evil, as well as guest roles on CSI, CSI: Miami, ER, Without a Trace, Dead Like Me and others. He also recurred on the television show Stargate SG-1 as "Lord Zipacna" (based on the Mayan mythological figure Zipacna) and on Lost during seasons 4 and 6, in which he played as the antagonist Martin Keamy for 12 episodes. Durand married long-time girlfriend Sandra Cho on October 1, 2010. Their daughter, Amélie Moon Durand, was born on August 30, 2015. He is good friends with actor Russell Crowe and performed as a guest vocalist with Crowe's former band 30 Odd Foot of Grunts. Durand and his family reside in Los Angeles. 2010 American Dad! CIA Guy (voice) Episode: "Great Space Roaster"
^ nurun.com. "Timmins Press". Timmins Press. ^ a b c Deerwester, Jayme (May 27, 2008). "For Durand, playing the 'Lost' psychopath can be a blast". USA Today. 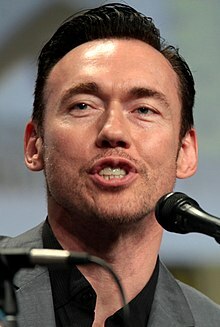 ^ "Kevin Durand to Play the Blob in Wolverine". MovieWeb. Retrieved September 2, 2016. ^ Sturdivant, Brad (May 7, 2010). "Kevin Durand reteams with Hugh Jackman in Real Steel". Flix 66. ^ Walkuski, Eric (September 9, 2011). "More Resident Evil 5 Casting News: Kevin Durand, Johann Urb... And Oded Fehr?!". JoBlo.com. ^ Kroll, Justin (6 July 2012). "Durand, Maillet join 'Mortal Instruments'". ^ Goldberg, Lesley (April 26, 2013). "'Lost' Vet Joins FX Vampire Drama 'The Strain'". The Hollywood Reporter. ^ Trumbore, Dave (June 18, 2014). "VIKINGS: Season 3 Adds New Cast Members Including Kevin Durand, Morgane Polanski, and Ben Robson". Collider. ^ Rayne, Naja (September 2, 2015). "Kevin Durand Welcomes Daughter Amélie Moon". People. ^ Boucher, Geoff (November 12, 2018). "DC Universe: 'Lost' Actor Kevin Durand Joins 'Swamp Thing' As Villain". Deadline Hollywood. Archived from the original on November 12, 2018. Retrieved November 16, 2018.